Police, Fire Brigades, Government Departments, Public Sector Undertakings, Ordnanace Factories, Departments of Atomic Energy, ONGC, Mines, Railways, Municipalities, State Electricity Boards, State Road Transport Corporations, Ports, Defence, Mills and many more. KHERAJ Sirens are widely used as a very effective announcer for Textile Mills, Factories, Workshops, Banks, Ships, Milk Centre, Air Raid Signals during war, Fire Engines, Police Vans, Ambulances etc. 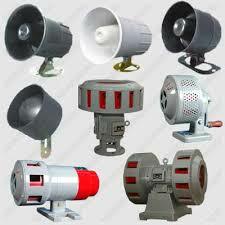 The important feature of PURE AC Siren is its being Carbon Brushless resulting in zero maintenance cost.